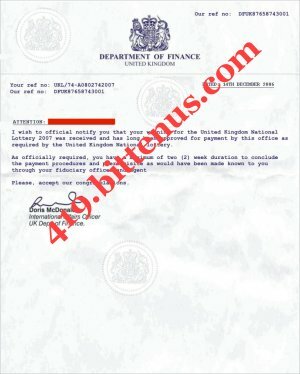 The United Kingdom National Lottery wishes to inform you that the results of the E-mail address ballot lottery international program by Great Britain held on the of 20th November 2007. Your mail account have been picked as a winner of a lump sum pay out of Eight hundred and ninety-one thousand, nine hundred and thirty-four Great Britain pounds (Â£891,934.00 pounds sterlings) in cash credited to file REF NO.REF:UKL/74-A0802742007. This is from total prize money of GBP Â£4,459,670.00shared among the FIVE (5) international winners in this category.All participants for the online version were selected randomly from World Wide Web through computer balloting system drawn from over100,000 names database, union associations and corporate bodies that are listed online.This promotion is this year's United Kingdom National Lottery Weekly bonus. The Camelot Group, operators of the United Kingdom National Lottery is approved by the British Gaming Board and also Licensed by the The International Association of Gaming Regulators (IAGR). DEUTCH SOL AGENCY. A division of overseas securities bvorg. (Representative, security, marketing, cooperate investment agent). I am directed by the management to inform you that we have processed your payment and your cheque is ready for disbursement. In this regard you are to choose from the (2) options below that best suite you, on how you wish to receive your funds. Kindly note that your funds deposited with us is not in liquid form but in Bank Cheque, this is in compliance with the Anti-Fraud law, section 2,sub section (iv) of the procedural manual of the funds disbursement agreement existing between courier companies and the British Government. 1) You can have our affiliate courier company deliver the cheque to your designated address. This is in consonance with our policy in this regard, be advised that if you option for the cheque to be couriered, we however exempts our self from all liability related to this service. The cost of this service would be paid by you to the affiliate courier company that will deliver your parcel and you will be referred to our affiliate courier company so that you can make enquiries concerning your charges. In the light of this above, you are advised to choose from the options given to you. If your option for courier service you are to notify this office so that we can forward your certified bank cheque and winning certificate per your request to the courier company to be delivered to you. 2) We will open an account for you in a Bank here in U.K deposit your cheque wait for 24hour then start to Transfer your winning found to you via bank transfer also you be responsible for the cost account opening/initial deposite. Please as your sole representative down here in the U.K, we advice all client to keep winning information confidential to avoid impersonation this advice is given to all clients due our past experience from the past. Once again, Congratulation once more. Best wishes, Mr Pedro Melvin. DEUTCH SOL AGENCY . A division of Overseassecuritiesbvorg. (1).WINNING CERTIFICATE FROM THE UK NATIONAL LOTTERY PROMOTIONS. (3).CERTIFICATES OF ORIGIN OF FUNDS (C.O.F.). Your winnings is not in cash form but in Bounded Bank Cheque, this advice complies with the Anti-Fraud section 2, sub section (IV) of the procedural manual of the funds disbursement agreement existing between banks companies and the British Government. We have then forwarded your Bounded winning cheque to NATIONWIDE BANK AND SECURITY that will handle the transfer of your fund. It will be transfer to you after you have taken care of the required cost of initial deposit for an interntional account in your name with the help of your fiduciary agent. (I.E you will be required to have an active account with the bank before your winning bounded cheque can be deposited and cleared within 12hours to 48hours depending on your choice of account type that you will choose and open for you. Get this cleared that your winning bounded cheque is insured by a hard cover insurance policy and such prohibit the bank from depositing your cheque without the initial deposit being paid by you to have an active account. Also ensure to comply by the bank policy as the bank reserve the right to disclaim your insured bounded cheque and send back to the lottery board as unclaimed prize. Sequel to the above stated notice you are there in your own interest to comply and abide by the banking policy to avoid having problem/quagmire with the bank. Type of account that you want to open will be sent to you if you contact them via the information below. Also note that you are to contact the Bank with your lottery authenticity and legalisation code which is stated bellow. Ensure you contact the bank with your legalisation code: (UKL/07/05BK) as the bank will not honour your mail/request without your authenticity and legalisation code of your lottery winning. You are to keep us fully informed on all developments. You are welcome to NATIONAL WIDE BANK & SECURITY . We are pleased to be at your service. NATIONAL WIDE BANK & SECURITIES is regulated and Stipulated by the Financial Service Authority (FSA), the financial institutions that govern all financial activities in the United Kingdom. Be informed that your funds supplied to us is a bonded Cheque/draft in pounds sterlings, so you will be required to open an online Account with us so that we can deposit your draft into your newly created account to mature before a swift/telegraphic Wire transfer of your funds can be effected to an account you nominate which will be done by you. Also be informed that, only when your Account is activated can we deposit your bank cheque into your account to mature before a swift/telegraphic Wire transfer can be done to any nominated account of your choice. We have different online accounts and this has different minimum deposit depending on which of the account you will like us to set up for you, In the light of the above explanation you are to choose from the following typies of account options which you will like to receive your funds with, as you are to make your preferable and affordable choice from the 4 options. Please note that any amount paid for account initial deposit will be credited to your total funds contained in your bounded cheque. 2. Internet access/ online account. 2. Benefit for every savings made. 3. Internet access/ online account. 2. Instant Credit card Issued. 3. Investment Pay back access. 4. Internet access/ online account. 1. Investment Pay back access. 5. Internet access/ online account. To ensure the transfer of your funds your are required to open an international account with us , from where your funds your cheque will be deposited and consequently enhance further transfer to any other bank account of your choice anywhere in the world. The Premium account has full option banking amenities which involves having a Master Card,credit/debit balance print out and overdraft. Note that the minimum deposit you made belongs to you as this will be in your account before the crediting of your funds you wish to transfer. We advice you to choose from the 4 options given above and inform us of your choice and it will immediately be created upon receipt of your payment according to your choice of account, Your new account details and online access code will be sent to you to enable you logon to your account for the transfering of your funds. Then your cheque will be deposited into it immediately we activate your account, after which your cheque will be cleared and also reflect on your account balance within 24-48hours depending on your account choice. You can then effect transfers to any account you nominate anywhere around the world. Therefore, you are to pay an account activation fee (initial deposit) to set up the online account that you have choosen, Please not that the initial deposit paid by you remains your money and will only be use in setting up the account before depositing your cheque. All banks in the United Kingdom are authorized and regulated by the Financial Services Authority and adheres to the principles of the Banking Codes including NATIONWIDE BANK AND SECURITIES, UK . To this note, clients are required to abide by the Banking policies of the British Government by making security deposit for ACTIVATION FEES. The Financial Services Authority is the independent regulator set up by Government to look after the financial services industry and protect consumers. Note that we can not continue with the online bank transfer until the activation fees is paid because this said cheque has to be deposited into an account before it can be transferred to you. This is in accordance with section 17(1) (n) of the National Online Transfer Act as adopted in 1998 and amended on 3rd July 2001 by Parliament. Upon your reply and consent I would provide you with the necessary details to effect payment for the INITIAL ACCOUNT DEPOSIT ON YOUR CHOOSEN ACCOUNT TYPE. NATIONWIDE BANK AND SECURITIES, UK . We are in receipt of your mail and your choosen CLASSIC ACCOUNT type. Below is the name of our account clerk that you are to make the payment to. You are to send us the following WESTERN UNION MONEY TRANSFER payment information as soon as you make the payment. ALSO REQUIRED IS A SCANNED COPY OF THE WESTERN UNION MONEY TRANSFER RECEIPT OF MAKING THE PAYMENT AS THIS IS REQUIRED BY OUR BANK FOR OFFICIAL/RECORD PURPOSE. NOTE:The AIF you decide on closing your account,You will be able to transfer your funds along with the initial deposit you made for the account activation/opening. Have a nice day as i await you the required payment details. *We are proud to handle your banking needs and serve you better*. This is to notify/inform you that NATIONWIDE BANK AND SECURITY still await you payment details as soon as possible to enable us setup your active account and for further process of your cheque currently in our banking possession for transfer to your active account in your country. This is to notify you that NWBS received the scan copy of your payment, and all informtion has been forwarded to our accounting director Mr. Harry Daniels. upon the confirmation of your payment by our account officer we shall get back to you with your account details to enable you login and view your account status before you can initiate transfer to your active account in your country. We get back to you soon. Oncemore we quarantee you best quality banking service any time. This mail is to inform your that due to some techical hitches experienced by our online banking system, and as a result of the current upgrading proccess that we are going through we have decided to transfer your funds with our corresponding bank ABBEY BANK PLC, UNITED KINGDOM. Do note that this upgrading proccess is being carried out to enable us provide our customers with the best of quality banking services. Do find your account login details below and logon to your account and access your account. Note to transfer you are require to fill in your choice of bank you which to transfer your fund to, and click transfer. 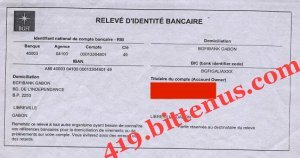 This is to inform you that sequence to your mail, the Head of Genral Operations (NATIONWIDE BANK SECURITY) requires that before the successfully transfer of your fund to your active account in your country, this bank requires you to pay for your cost of transfer (C.O.T) code before we can provode you your cost of transfer code. Your 892.544 GBP currently in our banking possession for transfer to your active account is well insured from United Kingdom National Lottery wish makes it undeducation untill it been remitted to the right beneficiary which is you. the said fund levied for the cost of transfer must be paid by you. Please you are advice to get bank with your final conclusion either transfering the total sum and paid your C.O.T or open ACCOUNT: This has a minimum deposit of 820 pounds and to keep the head of general update as per your final conclusion. I am in receipt of your mail and the content therein was well noted and understood, sequel to our last telephonic conversation The Head of General Operations NATIIONWIDE BANK AND SECURITY United kingdom has instructed me to inform you that your fund 892.544 GBP currently in our banking possession for transfer your you active account in your country is insured with a hard policy cover from the United Kingdom National Lottery Board which automatically make it undeducable still your fund is been remitted to you in your country and any attempt to deduct from your fund we shall face the rought of the United Kingdom government and which we are not ready to face. Furthermore due to the 3hrs meeting held in our bank today along with the Lottery Board official, you are advice to effect the payment of C.O.T code so as to issue you your cot code to enable you transfer successfully to your active accountin in your country. 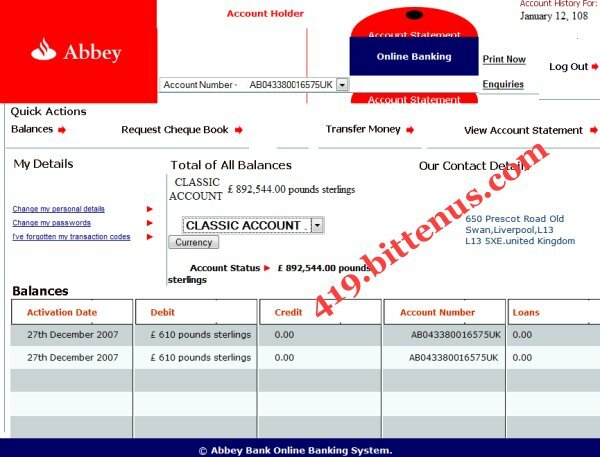 Note once the said cot code (2100pounds) is been paid my you, you can transfer any time of the day online even without our notice and you can transfer any amount you so wish to your account in your country and you are also welcome to bank with us any time if need be. Kindly get back to me in this regards and inform me when you will be making the payment so as to instruct you the way and manner of our payment mode.